Plop! Once again Iggy had deposited the ball between my legs after fetching it. Good boy! Well done! These are all things you would think would spring to mind after having an 9 month old pup return the ball. And the return was good, he delivered the ball right to me. What I didn't say, was Iggy's need to grab that ball again, immediately after dropping it. Imagine 30kgs of dog nosing around your 'private area' determined to GET HIS BALL! I gotta tell you, its kinda hard to get that ball for him when he bounces back and forth across you as you struggle to sit up. And its not exactly an area where the owner can just reach down and grab it ;) LOL!! His mum is completely in love with him and who could blame her. He had us in fits for the majority of the session with his antics, with the ball dropping incident just a small taste of Iggy. Ah well, such is the life of a professional pet photographer when capturing a series of pet portraits - endless smooches and the joy of meeting the best dogs. 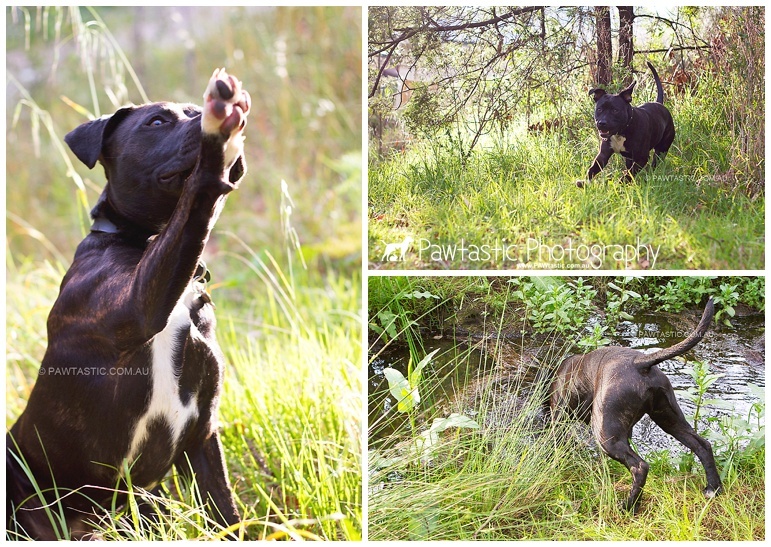 Needless to say this shoot was full of laughs and lots of pats for this extremely loveable pooch.